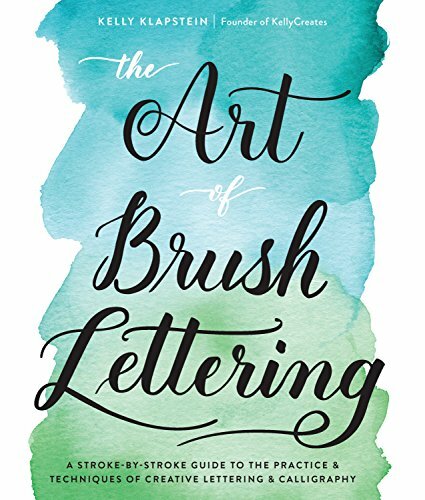 This is a comprehensive and accessible book for beginners who want to pick up the beautiful art of brush lettering. Kelly Klapstein is a teacher who teaches lettering and she has a lot of work on her website that you should check out. This book covers the basics of brush lettering, starting with the tools you need and then moving on to showing you the techniques required to create beautiful brush lettering art. The instructions are step-by-step, all the strokes are number and directions shown so you can follow along easily. You'll learn how to write upper and lowercase letters, and apply those techniques in your own style for your own letter. Other than writing, there's also a small section on applying effects, such as drop shadows to make the letters look more dimensional. You'll also learn have to blend colours within each letter. The last few pages in this 160-page paperback are some blank practice sheets for additional practice. This is a really detailed book. It goes into talking about the type of brushes or brush pens to use, care for brushes, the different types of paper, the correct posture for you when sitting and writing, and proper warm up exercises for your hands and fingers. This is a fun and informative book I can recommend easily to anyone.